I’m in Denver at the 2016 version of the madhouse that is the #ISTE2016 conference. Helping to spread the Best Keynote goodness and doing a session on Google tools later on. And it’s always fun. I see old friends and make new ones. I learn new things. But it can get to be a bit of nerd overload. After a while, the conversation about server loads, bit rates, digital learning environments, edtech synergy, companies that spell their names with a Z instead of an S, and the next technology revolution gets to be a little much. So it’s kind of nice to slow down a bit with other social studies folks to talk about maps and historical thinking skills. Yes. It is a session with the word digital in the title but it’s digital maps from the Library of Congress. I’m okay with that. Presented by Sherrie Calloway and Cappi Castro, the session focused on ways to support historical thinking and problem solving while using maps. Sherri and Cappi are part of the very cool Library of Congress Teaching with Primary Sources (TPS) program maintained by the TPS Western Region people at Metro State here in the Denver area. It’s that time of year. Right up there with Christmas morning, NCAA March Madness opening weekend, and the two meat dinner with ribs & hot links at Roy’s Pit BBQ. Yup. It’s NCSS conference time. I always learn so much. Meet so many people. And I always walk away better than when I walked in. And just like always, I’ll be trying to live blog sessions that I attend. So strap in. It’s gonna be a great ride. If you and your building are using Mac computers or IOS devices such as iPads or iPods, at least part of the answer is the Library of Congress. The folks over there recently released six free iBooks that can be quickly downloaded and are perfect for having students interact with primary source evidence. I get it. And I don’t disagree. Kids do need the facts. But I think for too long we’ve just assumed that acquiring foundational knowledge and historical thinking are two distinct and different activities. We fill up their heads with facts and then, if we have time in the school year and after the state assessments are over, then . . . we can try some of that historical thinking stuff. We need to stop doing that. The brain is not a basket that we can just fill up with stuff. The brain is a bucket full of holes. The brain works very hard to find ways to forget things and if something is not important enough to be useful, it’s gonna find its way out one of the holes. Facebook was once the small, sheltered territory of a couple of techie college students and some high school kids who found ways to sneak past the filter. At the time, it was all about Friendster and MySpace. Parents, middle school kids, corporations, advertisers are all over Facebook. Even teachers are using it. A couple of years ago, I published a quick post about using Facebook as a teaching tool with a Lincoln profile as an example. A tip on how to create an Eisenhower Facebook template followed and we followed that with more ideas on how to use a variety of Facebook and Twitter online tools in the classroom. Others were also thinking about how to use social media as part of instruction. More templates and tools like My Fake Wall sprung up everywhere. The part I like about using Facebook as a historical teaching tool is that it allows kids to bring in a variety of perspectives, primary sources and photos. The exercise forces kids to think in layers rather than simply memorizing data. Likes and comments by other historical characters, profiles and photo albums can be used to create a rich picture of people and events. Created by the people at ClassTools, Fakebook is similar to the old My Fake Wall. 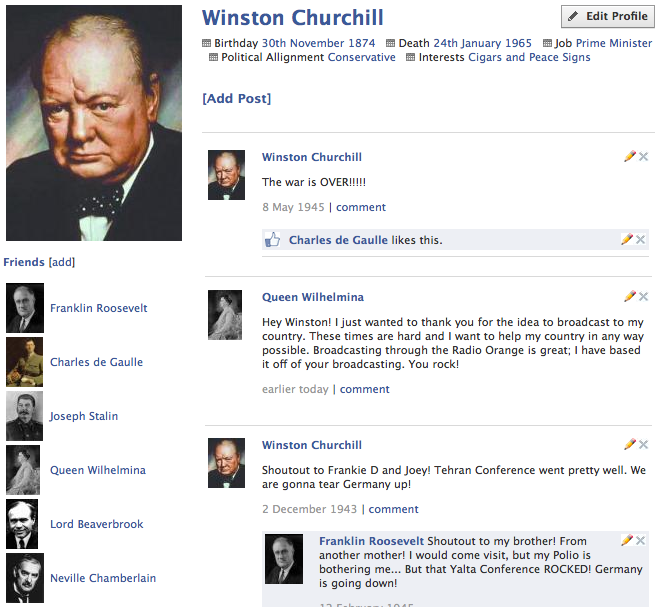 It’s a quick and easy way for you and your kids to generate historical Facebook profiles and walls. You start with a profile and add other Facebook elements step by step. Kids can complete their profiles and than send you the finished URL. ClassTools also has a nice portfolio of examples that you and your kids could use as inspiration or discussion starters. ClassTools wants you to create a premium account so there are ads on the completed profile. If that bugs you, just have kids take a screenshot of their finished work and send it to you as an image or pdf file. They could also print it out and turn in as a hard copy. Some nice stuff here. Give a try and let me know what works! It was some time ago that I wrote about The Invention of Air by Steven Johnson. I was impressed with Johnson’s account of Joseph Priestly, a British minister, scientist and political thinker who was also a friend and contemporary of Benjamin Franklin and Thomas Jefferson. And I had buried much of that stuff deep in the brain until I ran across a recent post on the Innovation Leadership Network. In Networks and the Information Glut, Tim Kastelle and John Steen write about the idea that social networks have always been around and how researchers have used those networks to gather and share information. When we talk about ’social networks’ we don’t just mean facebook and twitter. People have always functioned within networks, and these have always been important in the development and spread of ideas. It’s an interesting idea that I tried to articulate back in February 2009. My post was a bit all over the place and wasn’t really laser focused on the idea of social networks. Kastelle and Steen do a much better job of discussing how social networks of all kinds encourage creative thought. The fundamentals of innovative thought haven’t changed since the 18th Century – it’s always been aggregate, filter and connect. The great thinkers of earlier times corresponded extensively because it helped them aggregate information from a wide variety of disciplines and sources. Priestly used his connections with Franklin and Jefferson to gather, expand and share his research. We need to find ways to do the same as professionals and as classroom instructors. 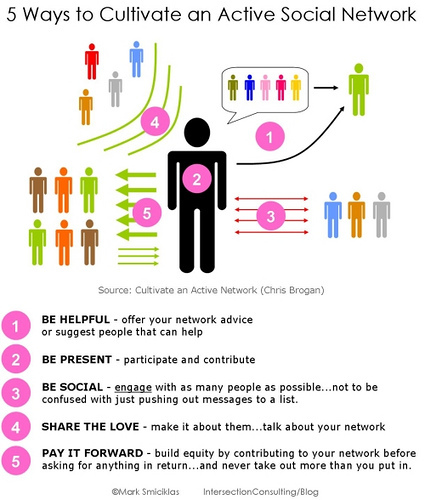 If you are not currently part of some sort of Personal Learning Network, you need to be. It’s hard for me to imagine how a history teacher can continue to be effective if they are not connected with like professionals to ask questions, share information and discuss current research. Delicious, Plurk, Twitter, Ning, uStream, SlideShare, LinkedIn and other similar tools can (separately or together) all be pieces of that network. It’s also hard for me to imagine trying to prepare students for the 21st century without training them to aggregate, filter and connect appropriately. And while the Priestly, Franklin and Jefferson versions of those tools still exist (US postal snail mail, for example), we also need to work to find 21st century tools that students can use. Use Delicious to gather and share resources with your kids and train them to do the same. Use iPod Touches in the classroom as a relatively cheap way to aggregate data and connect with others. maybe all it will take is to become more old-fashioned in our thinking.